Join this burly gentleman in the pub for a bit of online spinning and few pints today. 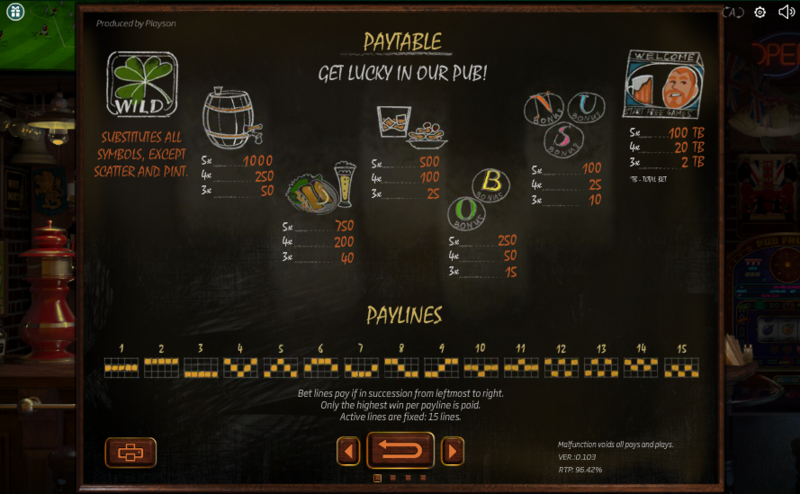 Down the Pub is an English classic from hot game developers Playcon which orders you to collect some glasses and spin through 5 reels of pub-themed online easy slot symbolism. Match letters, pints, nuts, and clover wilds as the intimidating pub regular watches on. Playson is a leading gaming company that currently offer 40+ online games with many more to come this year. It has headquarters in Malta and works with many platform providers including GamingTech and Leander. They design and develop customised slot games to suit each players needs and requirements. Playson have over 250 staff that all strive to ensure games and developed to provide the best gaming experience possible. All games are built with advanced HD graphics and new technology, so they are a cut above the rest and one of our favourites here at slot games uk. As you can tell from the title this 5-reel, 3 rows, 15 payline take places down the pub with symbols and a background of everything you’d expect down the pub, with your standard bar fly hanging around the bar with his pint and football on the TV screen in the corner. The game is playable from 30p per spin. The symbols in the game include a beer keg, a ploughman’s dinner, some bar snacks and letters spelling out the word ‘BONUS’ on the beer mats which are also useful in the bonus features. The scatter symbol in the game is a drinker. The wild symbols in the game is a clover which substitutes all over symbols except for the scatter symbol and the pint icon to create a winning combination. 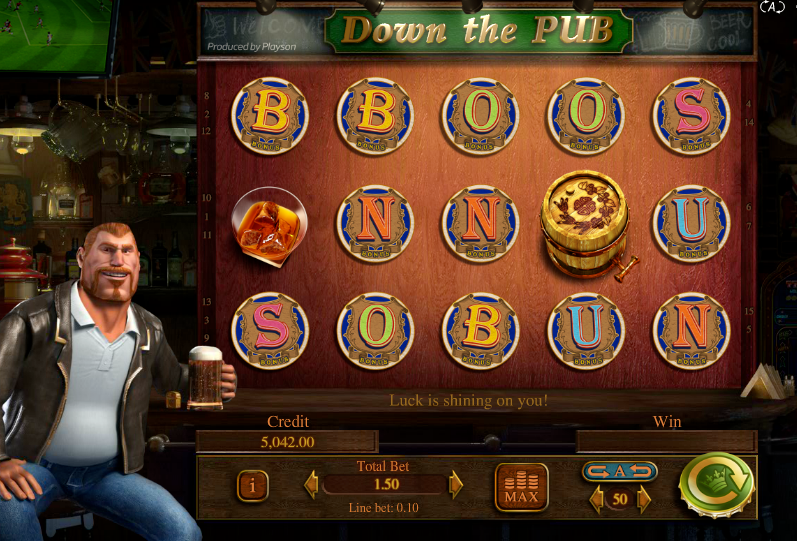 Down the Pub comes with 2 additional features including free spins and the fruit machine bonus round. The free spins feature can be triggered when you get 3 of the scatter symbols anywhere on the reels. The free spins will start to spin and stop once three-pint glass symbols appear on the reels. The pint glass will bring you multipliers, 1 pint glass will give you 2 multipliers, 2 pint glasses will give you 3 multipliers and for three pint glasses you will get a multiplier of 10x worth. You will get an extra free spin after the third pint. We also often run various promotions with this game. Visit Easyslots.com now! The Fruit Machine Bonus can be triggered landing on the letters that spell out ‘BONUS’ in corresponding order. This mean you get to play the traditional fruit machine slot game mixed with a trail and every spin will give you moves to move around the trail. The bonus round also comes with additional features including nudges, jackpot wins, boosts and multipliers prizes. You start off this round with three lives however if you find bombs you will lose a life if you find three bombs you will lose all your lives and the round will be over. If you enjoyed Down the Pub you might also like Mega Moolah.